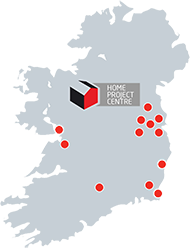 Our brand new showroom on Hanlon’s Corner, Old Cabra Road is NOW OPEN 7 DAYS and profiles all of PH Ross’s new stylish bathroom and tiling collections. The showroom has been designed with 25 stylish bathrooms in a domestic style setting, making it easier for customers to visualise the collections in their own homes. From classic bathrooms to modern cutting edge fittings, there is something for all tastes.